Who needs archaeological evidence when you can study the spread of cold sores? 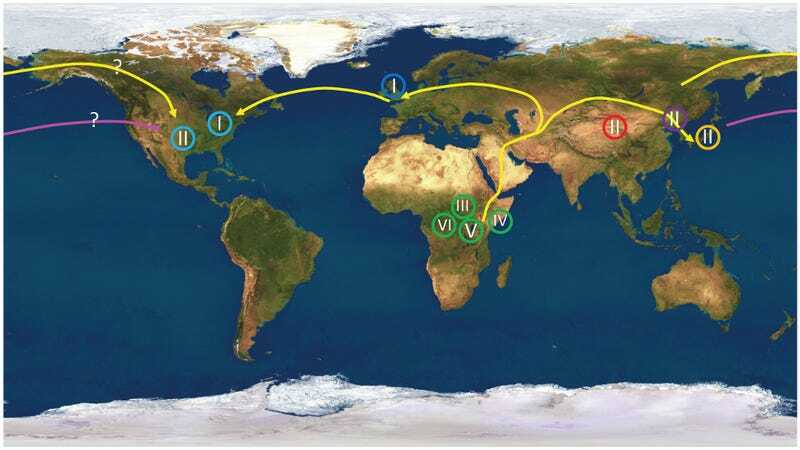 By analyzing the full genetic code of the all-too-familiar HSV-1 herpes virus, biologists have confirmed a long held theory of ancient human migration routes, namely the “out-of-Africa” hypothesis. Herpes has been plaguing humans for millennia, and it has been piggybacking off its human hosts ever since we left Africa some 150,000 to 200,000 years ago. For the study, the researchers compared 31 strains of HSV-1 collected in Africa, Europe, Asia, and North America. Then, by mapping the mutation patterns of the virus, they were able to reconstruct the way herpes hitchhiked on humans as they traversed around the globe. By using high-capacity genetic sequencing and advanced bioinformatics, the researchers were able to parse through the massive amount of data embedded within the 31 discrete genomic strains. Brandt’s team studied changes in the sequences of bases, or “letters,” of the herpes genome. This allowed them to construct a kind of family tree that showed when particular strains had their last common ancestor. The team broke the HSV-1 genome into 26 pieces, made the family trees for each piece, and then combined the trees into one network tree of the whole genome. And because the researchers linked herpes to specific locations, they were able to map the spread of the virus — and humans — across time and space. And remarkably, the various viral strains matched exactly what anthropologists and molecular geneticists have been saying for decades — that humans originated in Africa, spread out into Europe and Asia, and then ultimately crossed the Beringia “land bridge” into North America. The researchers were particularly stoked about how their research fueled the out-of-Africa hypothesis. Analysis of the African strains showed the most genetic diversity, a strong indication that they had the oldest roots. “Our results clearly support the anthropological data, and other genetic data, that explain how humans came from Africa into the Middle East and started to spread from there," noted Brandt. Indeed, the research affirms the idea that a small human population passed through a “bottleneck” to get from Africa to the Middle East, then going their separate ways to Europe and Asia, and then to the Americas. Every HSV-1 sample from the United States matched the European strains — except one that was isolated in Texas. There are only two possible explanations: The sample came from someone who had travelled to the U.S. from the Far East, or it came from a native American whose ancestors crossed the land bridge across the Bering Strait some 15,000 years ago. If it’s the latter — which seems likely — the researchers found support for the land bridge hypothesis. What’s more, the date of divergence from the most recent ancestor was 15,000 years ago — a near perfect match. The researchers therefore suspect it’s an Amerindian version of the virus. Oh, unless Europeans somehow crossed the frozen Atlantic. And this wingnut historian is right.